German writer; born at Breslau Nov. 19, 1808; died at Blasewitz, near Dresden, June 26, 1872. In 1828 he became a Catholic. He lived as a journalist in Berlin (editing "Eulenspiegel," 1829), Munich ("Das Schwarze Gespenst," 1830), Berlin ("Neuer Eulenspiegel," 1831; "Figaro," 1832-36), Hamburg ("Argus," 1836-38), Mannheim, Leipsic ("Charivari," 1842-52; "Narrenalmanach," 1843-49), Paris, Brussels, and after 1860 in Blasewitz. Öttinger wrote many works, comprising novels, poems, satires, and historical and bibliographical writings, a complete list of which may be found in "Moniteur des Dates," vi. 83, Dresden, 1868. Among them may be specially mentioned: "Buch der Lieder" (Berlin, 1832; 5th ed., Leipsic, 1850); "Der Ring des Nostradamus" (Leipsic, 1838; 2d ed., ib. 1845); "Historisches Archiv" (Carlsruhe, 1841); "Bibliotheka Shahiludii" (Leipsic, 1844), a bibliography of chess; "Graf Saint-Germain" (ib. 1847); "Rossini" (ib. 1847); "Bibliographie Biographique" (ib. 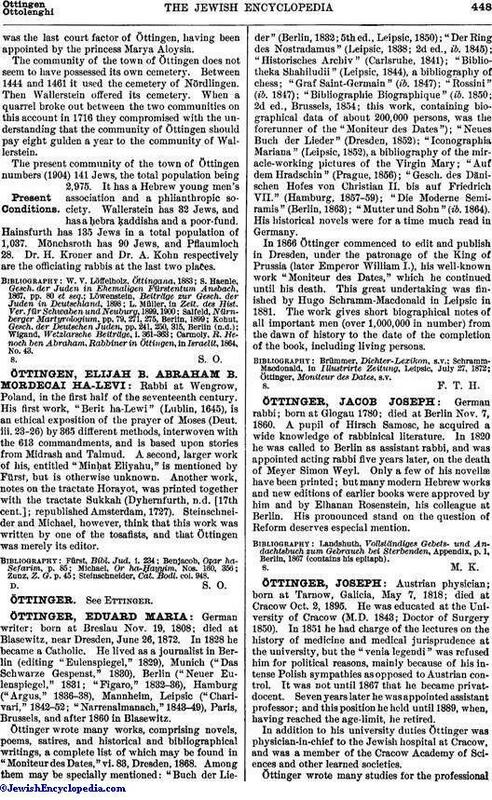 1850; 2d ed., Brussels, 1854; this work, containing biographical data of about 200,000 persons, was the forerunner of the "Moniteur des Dates"); "Neues Buch der Lieder" (Dresden, 1852); "Iconographia Mariana" (Leipsic, 1852), a bibliography of the miracle-working pictures of the Virgin Mary; "Auf dem Hradschin" (Prague, 1856); "Gesch. des Dänischen Hofes von Christian II. bis auf Friedrich VII." (Hamburg, 1857-159); "Die Moderne Semiramis" (Berlin, 1863); "Mutter und Sohn" (ib. 1864). His historical novels were for a time much read in Germany. In 1866 Öttinger commenced to edit and publish in Dresden, under the patronage of the King of Prussia (later Emperor William I. ), his well-known work "Moniteur des Dates," which he continued until his death. This great undertaking was finished by Hugo Schramm-Macdonald in Leipsic in 1881. The work gives short biographical notes of all important men (over 1,000,000 in number) from the dawn of history to the date of the completion of the book, including living persons. Öttinger, Moniteur des Dates, s.v.